Among the many things on Impact 25 selection Amy Purdy's busy calendar in 2014: posing for ESPN The Magazine's Body Issue. Purdy joined Natalie Coughlin (far left) and Elena Delle Donne (center) at the espnW Summit in October. I celebrated my 22nd birthday in a coma. It was the end of October 1999 when I started getting a headache. My neck hurt. I felt ... sick. I wish there was some specific thing I could describe that would explain to you what death feels like. Some people reading this probably know exactly what I am describing. And if you don't know, well, I'm glad you don't know. Long, long story, very, very short: I was flown by emergency helicopter from my school, Penn State, to Hershey Medical Center. By the time I was loaded onto the helicopter, I was already gone, drifting into a medically induced coma. A week later, I awakened, having missed my 22nd birthday but lucky I made it to that age alive. I had contracted something called bacterial meningitis, and it had destroyed my hands and feet (think about what frostbite does to your body -- that's similar to how meningitis poisons the blood flow to your extremities on its way to killing you). I spent the next year fighting to walk again, enduring multiple amputation surgeries on my feet. Around the same time in 1999, Amy Purdy was fighting the same fight. She got sick in July 1999 at the age of 19. Like me, she spent the tail end of 1999 and a good chunk of 2000 trying to figure out what just happened. And more important: What now? You've probably heard Purdy's story. She's battled back from her illness, which resulted in her losing both legs below the knee and requiring a kidney transplant. 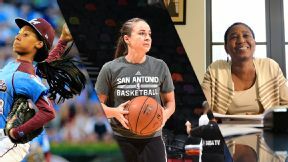 She's turned what could have been a curse into an incredible life and career as a Paralympian, a world-class snowboardcross athlete, a "Dancing with the Stars" favorite and, now, a member of espnW's 2014 Impact 25. Amy and I sat down recently during a flurry of promotional appearances for her new mission: raising awareness for bacterial meningitis vaccinations. espnW: Take me back to the day you got sick. Amy Purdy: I woke up feeling great. I went to work that day [as a massage therapist]. I did a few massages, but then I started feeling really rundown. I thought maybe I was coming down with the flu. I went home early, and I had a fever that night. The next day, I told my family I thought I was coming down with the flu. But instead of getting better, it got worse. I ended up getting rushed to the hospital. By then, I was in septic shock and needed to be on life support. I was given less than a 2 percent chance of living -- that was all within 24 hours of feeling sick. At that point, I was nearly dead. Did you end up in a coma? Yes, they put me into a medically induced coma. Pretty much every organ in my body was hemorrhaging and shutting down. Only my heart and my brain were OK. The tests showed I had bacterial meningitis. It sounds like you know how traumatic that is. I got sick when I was 21; you got sick at 19. I've found that one of the blessings is, at a very early age, I realized how fragile life can be. It forces you to grow up very quickly. My biggest concern back then was whether I shaved my legs that day, or if I put on a few pounds. Then suddenly my life was flipped upside down. I was losing my legs and my body was never going to be the same. But I had another opportunity at life, and it put everything in perspective. For all I knew, I could only have another day or another year. Every day that I am healthy, I want to use that day to its fullest now. It has been a good thing for me to be extremely aware of my mortality. You're still 19, though, and you want to hang out with your friends, who are all 19, 20, 21 years old. They don't have that perspective. And because of that, I have found myself migrating toward older people. I haven't thought about that before, but it's so true. I definitely would say the same thing. Even though I wanted to go out and drink and party with people my age, I had to force myself to be more responsible. I grew up a lot faster than most people my age. And I connected a lot more with people who were out of that phase. There's no way to go where you and I have gone and not come back changed and aware of how precious life is. After I got sick, there was a certain amount of denial about the loss. You do have to process that loss and mourn what's gone and accept what your life will be like going forward. How did you do that? You do have to mourn. There wasn't a major depression episode for me. It came on in various smaller circumstances. I remember thinking, "Oh my gosh, my friends just throw on dresses and heels and run out the door? I have to sit here and figure out how to make my legs work." Those moments hit me early on, how much different my lifestyle was. I just tried to deal with one thing at a time, which allowed me to take things in little bits and not get overwhelmed. I've found that when I tell people that my feet hurt, they instinctively give me a free pass. They are so sympathetic and understanding if I need to just lay in bed. But that's an infectious disease, too, isn't it? I'm 37. I have three daughters. I catch myself on Saturday afternoons running around in the front yard, chasing them, having a blast ... then the pain hits me, and I have to stop. In those moments, it really bums me out that I got sick at such an early age. It's when I compare myself to what other people are able to do that I run into trouble. It is a bummer. I just constantly try to put things into perspective. Yes, there are losses here. But there are also lots of gains. I wouldn't be where I'm at today if that hadn't happened to me. I usually allow myself a moment to mope, then I get over it and move past it. In a lot of my dreams, I have my feet. What about you? This is a fun interview, just having so much in common. In my dreams, whatever I am doing, I look down to see if I have prosthetics. It sets my time frame in my dream, I think. I'd have these dreams that I am running and launching myself, and I look down and see that I have prosthetics. I have a lot of those, where I do great, amazing things with my prosthetics. I miss my toes sometimes. I'll see somebody clipping their toenails, and I'll be like, "Aw, look at that. I remember when I used to clip my toenails." I have a friend who survived the Boston Marathon bombing, and she has a prosthetic leg on one side and a foot on the other side that is just crushed. It's to the point where she wants it amputated because she can't function with how it is. But her biggest hang-up is that she is going to miss her toes. I can't really say I miss my toes. For you, having half a foot on both sides, it's probably hard to see the first half of the feet and not think about the other half that's gone. I do miss my feet and the simplicity of just getting up and throwing on clothes and shoes and going. I have kind of an ankle fetish right now. If I see a girl with pretty ankle bones, I think, "That's so feminine and beautiful." Did you love your ankles? No, actually, I didn't. My feet were not my favorite part of my body. They were not pretty feet. I am so used to this now that I don't miss them. It's my normal, and I don't think anything of it. I get hung up sometimes thinking about what my life will be like when I am 80. Does that happen to you? You can't go there. You have to live in the moment. In any way you can, you prepare yourself for the future. But every minute or hour you spend thinking about life when you're 80 is a minute or hour you lost. There are times when I worry about thinner skin some days, and how that will affect my prosthetic. But I don't even want to think about. I try to be appreciative for what I have right now. Why is the campaign so important to you? A lot of people know me from Paralympics and "Dancing with the Stars." Most people have heard of bacterial meningitis at this point. But I don't think people realize they are at risk, or their kids are at risk, and, most importantly, that there is a vaccine. It's one of those things that people just think won't happen to them. I want to boost awareness, so people can make educated choices about the vaccination. It's heart-wrenching to meet people who lost someone and they say they had no idea about the disease and the vaccination. I think about this scenario often: If someone gave me a magic button and I could go back in time and not get sick, would I do it? I think I would. But I would stare at the button for a long time, because I wouldn't want to give up some of the things I learned at age 22. I would definitely not go back. It has made me the person that I am today. It tested me to see what I was really made of. I always wonder where I would be if it hadn't happened. I don't think I would have made it to where I'm at today without getting sick.